A former member of the Saints backroom staff has been suspended from all rugby activity for two years after failing a drugs test. Phil Robinson, who was an assistant analyst at the Franklin’s Gardens club, tested positive for cocaine after making an appearance in an ‘A’ League win at Gloucester in September. The former Derby and Nottingham scrum-half had been travelling to video the game when called in at late notice by the Northampton coaches and took his place on the bench at Kingsholm. But after coming on for the final five minutes, replacing Jamie Elliott, he was one of two men pulled in for a random drugs test and was found to have cocaine in his system. Robinson, who had been a replacement in pre-season games for Saints, had taken the recreational drug on the previous Saturday night. He has not worked at Saints since and the RFU released the judgement on the case on Friday, banning him from rugby activity until September 27, 2016 - two years after he received the initial letter informing him of his provisional suspension. Robinson’s remorse was said to be ‘sincere’, with recognition that ‘his recreational drug taking has led his life to take a dramatically different direction from the one he expected or intended’. Saints were quick to issue a statement in response to the RFU judgement. It read: “Phil’s suspension came in very unfortunate circumstances. Although he had played for our second team on a handful of occasions as a stand-in he was not a professional player and had not been named in the squad for the game. “Phil was only requested to come onto the bench as injury cover while on the way to Kingsholm to film the match in his position as analyst. Until then there had been no intention for him to even be involved in the match. “However, the terms of his suspension and the RFU regulations are clear, and as a result Phil is no longer with the club in any capacity. 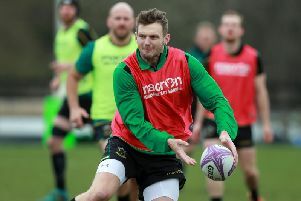 “Northampton Saints recognises that there is no place for drugs within rugby, and that they are contrary to the sport’s values.